I’ve told the story a few hundred times by now, I’m sure, but it never hurts to tell it again. I first knew I wanted to be a writer when I was 12 years old. Had always been a storyteller anyway (read as “compulsive fabricator”). Until 1997, even through years of workshops as an undergraduate, I was an undisciplined writer. I used to wait for inspiration to find me rather than report to my desk every morning and “grease the gears” even if the creative engine only revved up two days out of seven . Then, while I was unemployed during the summer of 1997, I read David Guterson’s Snow Falling on Cedars. I’d read a lot of good books by that point in my life. I was already in love with Hemingway, Kerouac, Kesey, Roth, and others, but when I read the scene in Cedars where Hatsue and Ishmael meet for the last time in the woods before she is shipped off to the internment camp, I cried. I don’t think any other writer had done that to me at that point in my reading life. When I finished the book, I finally knew why I wanted to write: I wanted to make that same kind of emotional connection through a story to some other human being the way Guterson had connected with me. Before, I think I wrote because of a desire for Stephen King like fame – and that’s no reason to write. So, on July 3rd, 1997, the day after I finished reading Snow Falling on Cedars, I had $300 to my name and no real solid job prospects, but I had made up my mind. 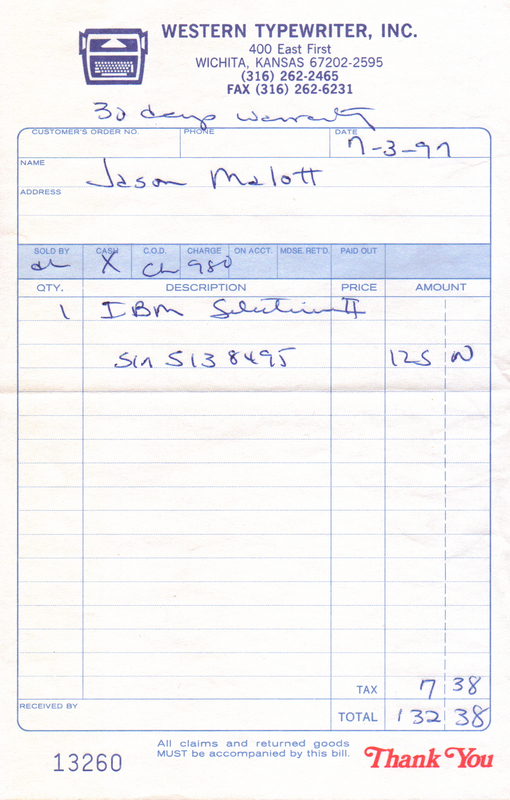 I bought an IBM Selectric II, a case of typing paper (about $20 in those days), and promised myself I’d sit down and write every single day (believe it or not, even though the world was in the middle of the dot com boom, I didn’t get my first computer until 2000). Since July 4th, 1997 (a little over 14 years now), I think I’ve missed a total of 10 days at my writing desk, usually due traveling in the days before I had a laptop. It was a quirky machine. Cut off the top of every third tall letter, didn’t matter if it was l, t, f, h, k – if it stuck its head above the top of a vowel on the third strike of any word it got chopped. But it worked in that deep, habit changing way. I no longer have the typewriter, although you can see a picture of it from time to time as my profile pic on Facebook. I think I’ll keep the receipt though, if only as a reminder of the distance I’ve traveled as a writer. Been working hard on the new novel, among other things. I’ve also been working on some new blog posts.